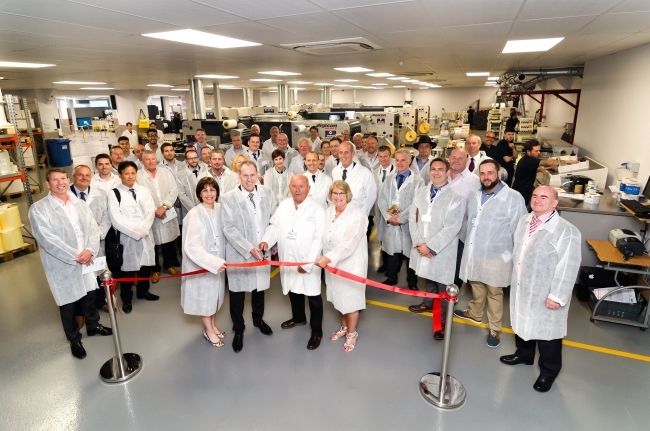 Global digital print, brand management and media company Springfield Solutions has officially unveiled it’s £1.3m Digital #PrintWorks expansion, in front of an audience of dignitaries and business partners. The investment, at the company’s headquarters in Thomas Street, Hull, has doubled the size of its digital print operation which takes the overall building footprint from 20,000sqft to more than 26,000sqft. Printing capacity has increased by 30 per cent due to the extra print area and a digital press and finishing investment. The move comes off the back of three years of significant growth, starting in 2014 when the company printed more than 100 million labels in a year for the first time. By 2015 this had increased to 140 million and 175 million last year. To cater for the continued further growth, the company had no choice but to expand. It includes a new Screen Truepress L350UV ink jet digital press and two new finishing lines from local Bridlington company AB Graphics International, bringing the company’s total operation to five digital presses. Dennis Ebeltoft, joint managing director of Springfield Solutions, said officially launching #PrintWorks has been a milestone in the company’s 42-year history. Since being established in 1975, the company has grown from one man, one press, to employing more than 100 people locally, and has worked with some of the world’s biggest and best companies. Mr Ebeltoft said: “We’re absolutely delighted to be unveiling our new #PrintWorks digital print room, which heralds the next chapter in Springfield Solution’s incredible story. The expansion has been made possible by taking over the building adjacent to Springfield Solutions’ existing print room, increasing the production footprint by 100 per cent. Many years ago, the two buildings had been one, housing a long gone printing company. Together they were known as the “PrintWorks”, the name which Springfield Solutions has revived for its expansion. Mr Ebeltoft added that the extra capacity the company now had would see them print millions more labels and improve lead times for print and brand management customers. “The development will enable us to continue our journey of growth and gain market share,” he said.